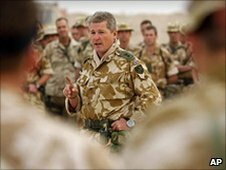 Colonel Tim Collins - whose eve of battle speech inspired his troops before the Iraq War - investigated the plight of at-risk soldiers who leave the forces and find that they are changed forever and having trouble adjusting to civilian life. He spent a night sleeping rough in Brighton with an ex-serviceman as his guide. For a true sense of the life faced by some of our former soldiers when they return to civilian life here in the UK, I have enlisted the help of 30-year-old Mark, a former soldier in a Welsh regiment. Mark will spend a night with me sleeping rough on the streets of Brighton. I dressed for the occasion - old army boots, Arran pullover, hoodie and leather jacket. We agreed I was allowed a sleeping bag and a hat and apart from £3 that was that. On the cold streets, Mark, now sober, described how his life descended into homelessness, alcoholism and crime after witnessing the carnage of the Omagh bombing during a tour of duty in Northern Ireland. Mark's life started its downward spiral when he was just 18. In the summer of 1998, his unit was called to the market town of Omagh to help move shoppers away from a reported car bomb somewhere in the town. Unknown to them, Mark and his colleagues were actually shepherding shoppers directly into the path of the bomb, just as the Real IRA had intended. Twenty-nine people and unborn twins died that day, the single worst atrocity in the history of the Troubles. "That's when the drink took control. We kind of came home and dealt with it in our own ways. Mine was to get drunk and stay drunk." He went AWOL and ended up beating a man so seriously that he was imprisoned in Germany. "I got into a fight - I was drunk - but I went a bit too far and really did this bloke over. I got sent to jail in Germany. Once I got back to the UK it was in and out of prison." As the temperature dropped in Brighton, Mark told me of life among the drinkers on the streets. "Its not that bad," he explained. "When you are in with the drinkers and the so called friends it's where the next drink is coming from that you are bothered about, not where you sleep. That just happens. I've fallen asleep standing up." Mark and I joined a queue near the seafront where a local church group doled out cups of soup and ham sandwiches. I asked a feisty Asian lady about some of the people she helps feed. "We know very little about them," she explained, "we just feed them. That's all." The church workers said they once had four ex-servicemen who were regular rough sleepers, but none now. Another well-spoken lady pouring soup recalled a serviceman who used to keep a suit rolled up in his rucksack in the hope of getting a job. "And did he?" I asked. "We don't know", came the reply. "We don't see him any more". That is the thing about being homeless in the UK - you are anonymous and invisible. On my night spent with Mark, one of the first things I discovered is that the threat of violence against rough sleepers is never far away. One bearded young man - swaying from the amount of booze he had consumed wanted to fight. We tried to ignore him until he finally gave up and staggered off. Later, one drunken reveller jeered into the darkened doorway at what he thought were vulnerable targets, not realising his taunts were aimed at a retired SAS officer and an ex-squaddie with several convictions for serious assaults under his belt. I asked Mark about his encounters with violence. "Plenty" he smiled. "I've been hospitalised three times. They did me a favour to be honest. Night in a clean bed it was." Mark was offered a way off the streets by the Royal British Legion and the Soldiers, Sailors, Airmen and Families Association (SSAFA) and he is now dry, living in his own flat and hoping to study criminology at university. "I could never go back to living like this," he said as we packed up our cardboard and sleeping bags as morning finally came. "Let's just say that would be the end of me." Mark was one of the lucky ones, but for the many others, like the ex-soldier with his interview suit rolled-up in his rucksack, it is a way of life I would never want for the men who served under me. Panorama: Forgotten Heroes, BBC One, Wednesday, 9 February at 2100GMT and then available on the BBC iPlayer .